Published September 1, 2015, Los Angeles Daily Journal – When the pope’s Ferrari sells for over $6 million, you know the weekend is going to be special — though no one could have predicted just how much. 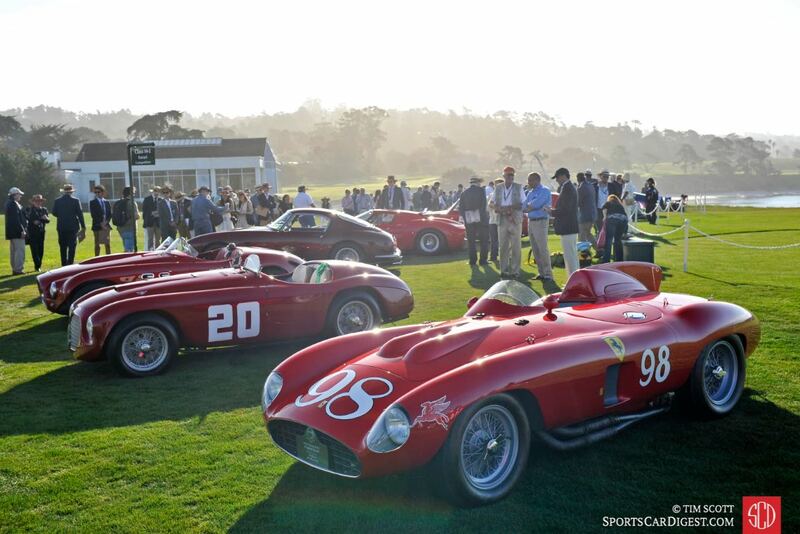 Last month marked the 65th annual Concours d’ Elegance — a gathering of the world’s most important collector cars on the famed Pebble Beach golf links. The weekend is dotted with champagne parties at spectacular seaside mansions, put on by Rolls Royce, Aston Martin and the likes for their special clientele; but the stars of the weekend are the elite collector car auctions that attract collectors — and investors — from around the world. The auctions are a sight to see, attracting a sub-culture of pedigreed car collectors who most were unaware even existed. Registered bidders come from some 30 different countries, with the intent of buying, selling or closely watching some of the rarest cars in the world. And the prices are staggering. By now, six years removed from the chill of the frozen economy, things are beginning to return to normal. Analysts predict new car sales to hit 17 million this year, a level not seen since 2000, and U.S. housing starts are at a robust 1.2 million per month and steadily climbing. Yet sales of classic cars have just gone off the charts, setting — and then breaking — records at an astonishing clip. The Pebble Beach weekend saw over $400 million of collector cars sold in just three days, marking one of the most explosive microcosms the world has ever seen. The weekend is dominated by two auction houses, RM Sotheby’s and Gooding & Company, both of which had record-breaking sales results, selling some 62 cars over the $1 million mark, and seven over $10 million. These are not anomalies. Hagerty’s Blue Chip Index, a study of collector cars prices over a 10-year period, shows just how valuable these cars have become. On average, collector cars have demonstrated a 500 percent increase in value over the last 10 years, with certain makes far outstripping even this pace. Ferraris, without a doubt, are the crown jewel. Several Ferraris make up the highest end of the market, such as the 1958 Ferrari 250 GT California, a cult classic among followers. Non-enthusiasts will best remember the Ferrari 250 GT as the Ferris Bueller car that suffered a fateful ending, after a spirited ride by the local valet. In April 2005, the average price of a Ferrari 250 GT was $1.5 million. By April 2015, 10 years later, the average price had climbed to $14 million, an 850 percent increase — and this is through the recession. What is more amazing is that the prices have continued since then. Last month, four months following the latest report by the Hagerty’s Blue Chip Index, a Ferrari 250 GT sold at Gooding & Company for $16.8 million ($2.8 million over the April 2015 Index value); and that was a car, as insiders say, that was “well-bought.” No one should be surprised to see this car return to Pebble Beach in a few years, crossing the block for over $20 million. As dizzying as those prices are, they are far from the top of the market. Last year at Pebble Beach, a 1962 Ferrari 250 GTO sold for $38 million, setting the highest price ever paid for a car at an auction. Now consider that the auction houses fetch 10 percent of the transaction price from the buyer and the seller — $7 million in this instance — and you start to get an understanding of the economics at play. While the $38 million record price is substantial, most 250 GTO owners are unwilling to sell for less than $50 million. But the market will likely get there, quickly. What is interesting to consider is strength of the market through a beaten economic time. To be sure, the market got hammered during the recession, but the speed at which it has rebounded is nothing short of dramatic. It will now be interesting to see what happens with the market, as the collectors become flusher with cash. While $20 million cars are out of the reach of most, it is the entry level collecting at the $300,000 mark that will make a difference. As more dollars vie for attainable cars, it will elevate their prices, pushing up the prices of the truly collectibles above it. And it is not just collectors who are in the game. The steady increase in the market has driven many to consider collector cars as solid alternative investments, and for good reason. A car well-bought will yield more passive income to the buyer than most workers in the advanced-world will make in years of full-time employment. Of course, it takes money to get in the game, and an uneducated buy can kill you, which is why professionally managed investment funds — a mutual fund of sorts for the collector car market — are becoming attractive investments. With the Dow Jones 10-year return at 62 percent, and the collector car market 10-year return at 500 percent, it is understandable that astute money managers have put together professionally led funds aimed at acquiring automotive investments. In fact, the S&P has developed the Dow Jones Investment-Car Index, pitting its returns against the 30 companies that make up the Dow — and the Industrial Average is not winning, not by a long shot. At some point, the market will fall; markets always do. Investors will scamper, and pundits will snicker, as prices fall to unthinkable levels; but when the market corrects, collectors will be left with ultra-rare assets that have important historical attributes that touch people in a way that most other investments don’t. Car collectors are driven by a passion to hold that piece of history that was important to them as a child, or to control a car that symbolizes a significant moment in time. As long as passion is involved, there will be people abound who are willing to make illogical decisions to satisfy their inner need, and this is why the collector car market will always be fertile ground for solid investment.